Another bar, another dollar – not much else that makes Cargo Bar stand out from the competitors. It's a nice place as usual, with expensive drinks and uptight security. Sound familiar? When I arrived with my little entourage at the entry, I must say, this was the first time in my life that security requested two forms of identification to get in. I'll make sure to take my birth certificate next time I visit. 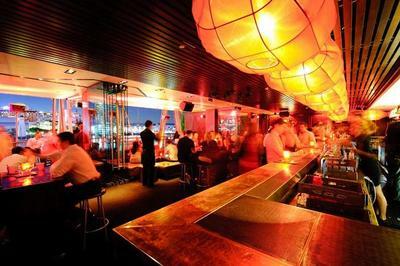 The ambience of the place is probably its best feature, with the dimmed red lights adding a relaxed feel on top of a largely black décor. Frothing for a bourbon and coke, a mate and I found the bar as soon as possible. Let's just say that drink cost more than our $8.30 cab ride from Broadway to Darling Harbour. That generally goes for all their drinks, but to be honest you're not getting a drink much cheaper anywhere else in the city. Cargo sits on the edge of the water in Darling Harbour and the unsaid rule is that any type of harbour view gives bars the right to charge of the chain for anything, especially drinks. Not that the view outside Cargo is anything to get excited over. However, the dance floor does reach some heights. If you're looking to get your dougie on to the early hours, Cargo is a good place for that – usually playing a great mix of old school tunes with the odd top 40 track making an appearance. There is even a live drummer belting out some beats which makes the experience all the much better. Food is on offer as well, but don't bother on Friday or Saturday nights unless you're keen to wait. If you're looking for the more personal and full on experience, there is an upstairs VIP area if you're keen to make a booking. At the end of the day, Cargo Bar is another standard city establishment that for me doesn't quite separate itself enough from the rest. Why? To work up a sweat on the dance floor. Over priced bar with poor services! Just went there ordered 3 jager bomb and male bartender fill the 3 short glass (not the regular pub glass) with only ONE redbull which is not enough to the shot glass to sink in. F tight and charged me $13 each. I’ve asked to fill up more with redbull then he opens up one more redbull to fill up and charged me extra $6. F ridiculous! I wouldn’t recommend any one to go there.